December 24, 2017 at 12:07 am. 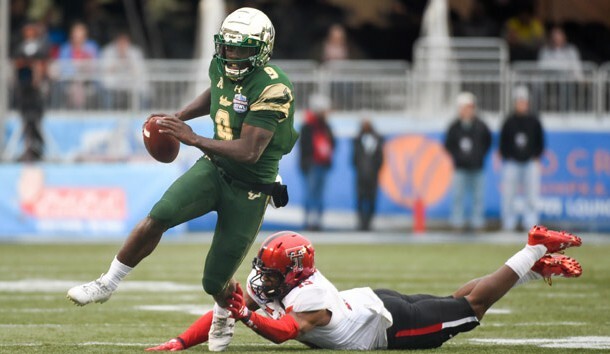 BIRMINGHAM, Ala. — Quinton Flowers’ record-setting career ended with the dynamic South Florida quarterback providing big play after big play. It also ended with him hoisting the Birmingham Bowl trophy after his 26-yard touchdown pass to Tyre McCants provided the game-winning points with 16 seconds left in a thrilling 38-34 victory over Texas Tech to allow the Bulls to finish with a 10-2 record. The winning touchdown came 1:15 after Texas Tech quarterback Nic Shimonek gave the Red Raiders (6-7) a 34-31 lead with a 25-yard scoring toss to T.J. Vasher. It was that kind of second half. Flowers finished with 417 yards in total offense and accounted for five touchdowns. Shimonek threw for 416 yards and three touchdowns. FORT WORTH, Texas — Kell Walker ran a two-point conversion after Darnell Woolfolk’s 1-yard touchdown run with 18 seconds left to lead Army to a scintillating victory over San Diego State in the Armed Forces Bowl. Raashad Penny’s 4-yard scoring run with 5:47 to play gave San Diego State a 35-28 lead but the Black Knights (10-3) responded with a 72-yard, 15-play drive and a 1-yard TD blast by Woolfolk. Penny rushed for 221 yards and four touchdowns for the Aztecs (10-3). Army eschewed an extra-point attempt and chose to pitch the ball to Walker, who ran untouched around right end for the winning conversion. MOBILE, Ala. — Jalin Moore helped Appalachian State bury Toledo 34-0 in the Dollar General Bowl.